During The Wizard’s Quest, you’ll build a custom scenario of your own creation that takes you on an adventure through Mirkwood. Along the way, you’ll encounter many familiar cards—but although the cards might look the same as what you've seen before, you'll soon learn that their abilities are new and unexpected. 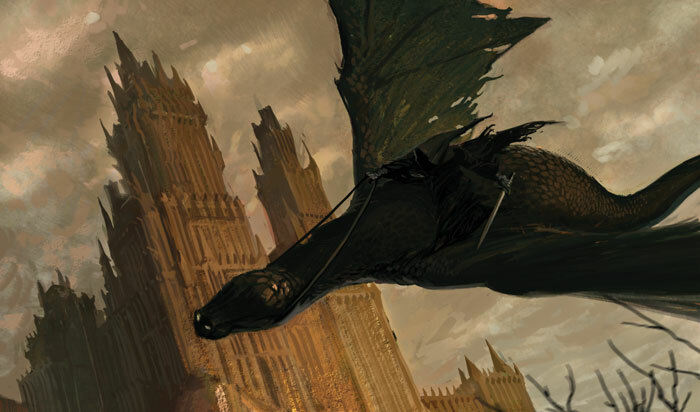 Have you ever thought about creating your own custom scenario for The Lord of the Rings: The Card Game? If you have, then you’re in luck because this year’s Gen Con special event, The Wizard’s Quest, is a build-your-own-adventure kit for fans of the game! It comes with everything you need to create your own quest deck and encounter deck. Each copy of The Wizard’s Quest comes with seven quest cards: one Stage 1, three different Stage 2 options, and three different stage 3 cards. Each player builds their own quest deck by choosing one Stage 2 and one Stage 3 to go with Stage 1. The quest stages that a player chooses will shape the narrative of their entire adventure and help them choose which encounter cards to include in their encounter deck. The Wizard’s Quest also comes with a total of seventy encounter cards. These cards are divided into fourteen different encounter sets of five cards each. 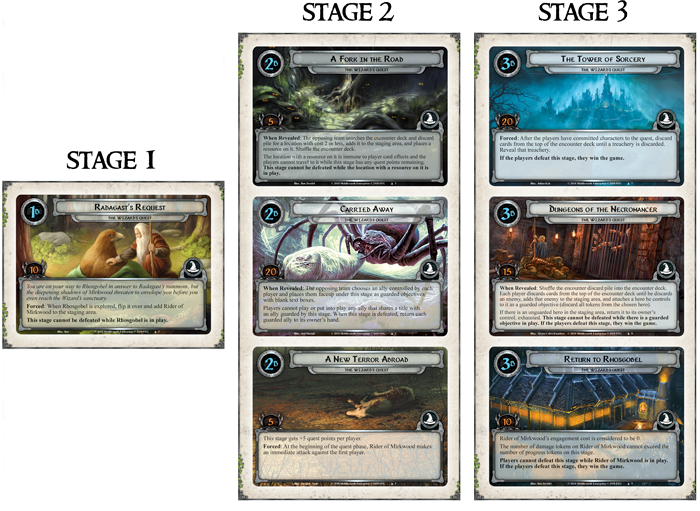 Each five-card encounter set includes a mix of enemy, treachery, and location cards, helping each player to build their own balanced, thirty-five-card encounter deck in mere minutes by combining seven encounter sets of their choice. This method of custom scenario building is what we call "Quick-build Rules." 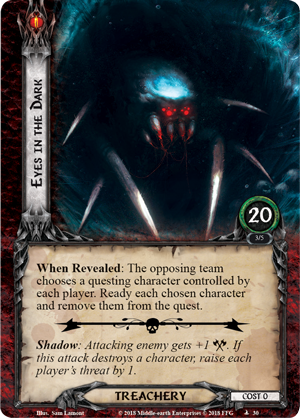 While Gen Con attendees will be encouraged to use the Quick-build Rules, players interested in greater customization options for setting up their own quest and choosing the dark forces arrayed against them can also use the “Advanced-build Rules.” When building an advanced custom scenario, each player can pick and choose individual cards from any of the fourteen encounter sets to build their encounter deck. To ensure that each player’s encounter deck is balanced, they must follow these guidelines: their deck must be exactly thirty-five cards and contain a minimum of ten enemies, ten treacheries, and ten locations. No more than three copies of each non-unique card can be included in an encounter deck, and no more than one copy of each unique card can be included. In addition to those restrictions, you'll notice that each encounter card in The Wizard’s Quest has its cost displayed in its lower right corner, ranging from zero to three cost. Each encounter deck cannot have a total cost of more than twenty-one. We gave each encounter card a cost to denote its power level and potential impact on the game. When building an encounter deck using the Advanced-build Rules, it is up to each player to determine how to spend their twenty-one points. Do you spend the majority of your twenty-one points on one-cost cards for a more evenly balanced experience? Or do you invest your points into several hard-hitting three-cost cards for a much more swingy adventure? The answer to these questions may depend on how you want to play your custom scenario. 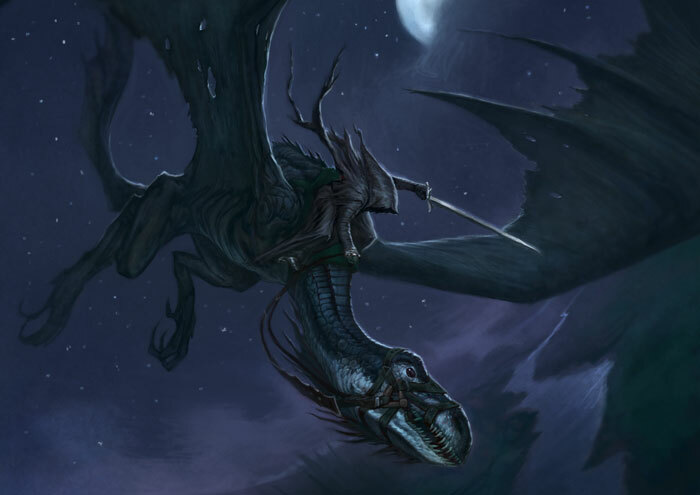 After players have built their own adventures, they can choose to play them cooperatively with their friends like any other The Lord of the Rings: The Card Game scenario, or players can challenge each other to a competitive match by trading scenarios with their opponent and seeing who can finish the other’s adventure first. By allowing the opposing team to make the choice it makes the encounter deck feel that much smarter because your opponents can evaluate your board state to make an educated decision, whereas in a typical scenario the encounter deck cannot do that. If you choose to play your scenario in standard co-op mode, then the first player always resolves these effects in the way that's most detrimental to the players. The design team and our testers had a great time play-testing this product both in co-op and competitive play because each format provided us with something new and exciting. 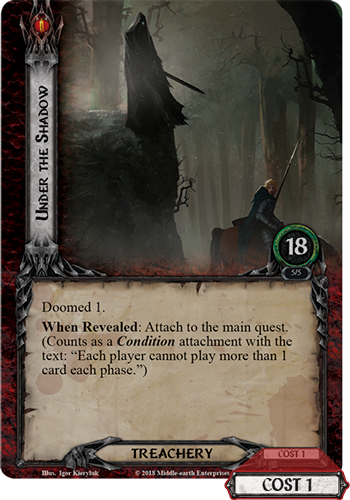 In co-op mode, players can customize the type of The Lord of the Rings: The Card Game experience they want to have. You get to choose your encounter deck’s strategy: It can be built around a few strong enemies, swarms of little ones, lots of locations, direct damage effects, increasing threat, etc, etc. You can make it as hard or easy as you want it to be. You can even surprise yourself with the Quick-build Rules by choosing your quest stages and encounter sets at random and playing your adventure with no knowledge of what’s in it. Competitive mode provides a new way to play The Lord of the Rings: The Card Game by pitting players against each other in a race to the finish. While this has technically been possible since the Race Against the Shadow rules were introduced in 2013, The Wizard’s Quest improves the experience by introducing an element of surprise into every adventure. When you play against a scenario built by your opponent, every reveal is a surprise. There is tension every time you advance to the next quest stage because you don’t know which Stage 2 or 3 they have chosen. And your decision of how aggressively to attack each stage can be pressured by how well the opposing team is doing against their quest. In testing, we often found ourselves charging headlong into disaster by advancing before we were ready—just because we were trying to keep pace with our opponents. This created some memorable game moments where our staging area was flooded with enemies and we had to use every card at our disposal to survive. Everybody loved how the competitive mode allowed us to play co-op with a teammate but also compete against the other team to see who could finish their scenario first. It really feels like the best of both worlds and occupies a unique space in card games. Adventure awaits in the depths of Mirkwood. Forge your own path through this ancient forest and add your own chapter to the saga of Middle-earth!